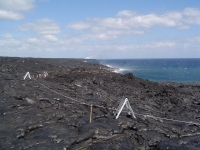 Lava on the Big Island. Photo by Atelier Joly. As the pilot gently lifted the plane into the dirty white sky settling over the island’s western coast, I put my head back, closed my eyes, and reflected on the past six days. They were days of triumph and tragedy, of beauty and banality, of chaos and calm, of dreams and disappointments … of heaven and hell. This was to be a short journey to paradise for the marriage of two young people deeply in love with one another. A trip designed as a closing climax to the sultry lazy days of summer, as well as a renewing transition to the waning days of autumn. An excursion where family and friends could laugh together, create joy-filled memories together, and bask in the wonder only a sunset wedding on a Pacific island can offer. This was to be a vacation, and as such, I spent very little time investigating our destination for this special moment. As the plane landed at the quaint little airport just outside of Kona, I excitedly anticipated lush green scenery, white sandy beaches, awesome waterfalls, and all the other images that come to mind when one hears “Hawaii.” However, as I drove the rental car out of the airport, a scene of desolation filled with dead vegetation and black volcanic rock greeted me. This barren landscape stretched as far as I could see; and with each passing mile, I felt my spirit sink, and my eagerness wane. After a few minutes, a distant mirage of green appeared on the horizon. The mirage grew ever larger until I realized, almost too late, this mirage was the destination. In the midst of the dull nothingness stood a place of plush green grass, a rainbow of flora and fauna so lush you felt as though you could squeeze moisture from the leaves. My energy soared as I drove down the main street of this resort village created along the western shores of Hawaii’s “Big Island.” Tree-lined roads interspersed with small retail centers, golf courses, hotels, and condominiums stretched for miles. Everything was pristine, trees and shrubs perfectly shaped, grass neatly cut and trimmed, sidewalks and streets immaculately clean. The townhome in which my family and I stayed had all the accoutrements I can only dream about having back home in Colorado. This was all wonderful, and yet it felt so shallow, so one-dimensional. On the second day of the trip, an older member of our party collapsed at the breakfast table and went to the hospital where she remained for two days while medical staff worked to diagnose her condition. On day three, I observed dozens of resort employees being bussed out of the resort to towns and villages located on other parts of the island. On day four, I learned this oasis filled with swimming pools, trained dolphins, and 24/7 activities existed on a pad of crushed lava rock and concrete. Except for the buildings, all of what I what saw was only 12-18 inches deep. This place was indeed a mirage, a superficial fantasy. The plane had leveled out at cruising altitude, and my thoughts turned to the symbolic nature of this oceanside resort. As Becker reminds us in The Denial of Death, it is inherent to the human condition to seek ways of cheating death. It is human nature to challenge the idea that life is finite, and that suffering is inevitable. My experience in the controlled environs of this fantasy on the (big) island demonstrates the lengths to which we will go to avoid the harsh bleakness life often brings. Once inside the gated confines of the resort, I was unable to see the dry, desolate land surrounding the enclave. Our existential approach to coping with the paradoxes, the twists and turns life brings is to sit with the pain, the emptiness, and the hopelessness, and listen to what it is telling us. This island expedition reminded me that there are times when I cannot escape the anxiousness of the moment, or the limited number of options I have to consider concerning a life choice. Over the six days, I once again encountered the paradoxes of life. Even in the meticulous and measured setting of a human-created Pacific island resort, the elements of human frailty and imperfection assert themselves. I re-learned that it is not the external setting that provides peace and contentment, but rather my willingness to embrace my feebleness and flaws that sets me on the path to centeredness. And in the midst of all the churning, yearnings, and unknowns, the young couple married on the edge of the beach with an incredible Pacific sunset as the backdrop. The bride was radiant and beautiful, the groom handsome and ecstatic. The parents beamed with pride. The reception continued the crescendo of the moment as family, friends, and guests gathered to eat, drink, and celebrate this union. However, it was not the surroundings making the moment special, rather it was the shared experiences, events, and relationships of those present that made the moment significant.